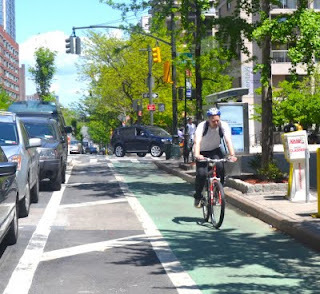 Tomorrow night, the transportation committee of Manhattan Community Board 7 will take public input on the possible expansion of protected bike lanes on the Upper West Side. On the agenda is a request from the board that DOT complete a proposal for protected lanes and other changes to the streetscape, including pedestrian islands, turning lanes and loading zones, on Amsterdam and Columbus Avenues from 59th Street to 110th Street. The existing protected lane, on Columbus from 96th Street to 77th Street, was narrowly endorsed by CB 7 in 2010. Six months after its installation, traffic crashes were down by 34 percent, and the number of traffic injuries dropped by 27 percent, according to DOT. Data collected by the city following the completion of the one-mile segment showed that, on the blocks of Columbus to the north and south of the bike lane, 29 percent of motorists were clocked speeding, while between eight and 17 percent of vehicles on the stretch of Columbus with the bike lane were found to be traveling faster than the 30 miles per hour speed limit. The protected lane is also popular with residents, according to a survey conducted by City Council Member Gale Brewer. Safe streets proponents want protected bike lanes running north and south, and want those lanes to connect with existing protected lanes on Eighth and Ninth Avenues. Nevertheless, a community board recommendation is no sure thing. Tomorrow’s meeting will be held at 250 W. 87th Street at 7 p.m.
Yeah, because the idea of “safety” on the UWS is probably never having to see anyone who doesn’t look just like you. With the present composition of the community board, the only way this passes is if supporters pack the room to support it. I’ll be there. Will you? Also, if this passes, it will very quickly transform the UWS into one of the most bike friendly neighborhoods in the city. The new facilities will directly connect to the newly-completed 9th Ave protected lane (4.7 mile corridor) , and indirectly provide an extension of the 8th Ave protected lane (~5 mile corridor). Very exciting! This would provide some of the longest, nearly uninterrupted stretches of protected bike lanes in the city, and would do well to get people to and from many destinations entirely on low-stress bike facilities. Also, this would be a HUGE benefit for the many senior citizens in the area, and anyone who has a hard time crossing wide avenues. All this for only a few parking spaces. A no-brainer if you ask me. It ALWAYS helps to email or call the Community Board with your support. Believe me, they get a lot of calls from people complaining about bikes so do your best to counter the hate! Streetsblog, can you add this to your calendar? It helps to have events listed in the calendar and not just in the article (which can easily get buried as more articles get posted). The columbus avenue lane is so nice and ends so abruptly. An extension would be loverly.